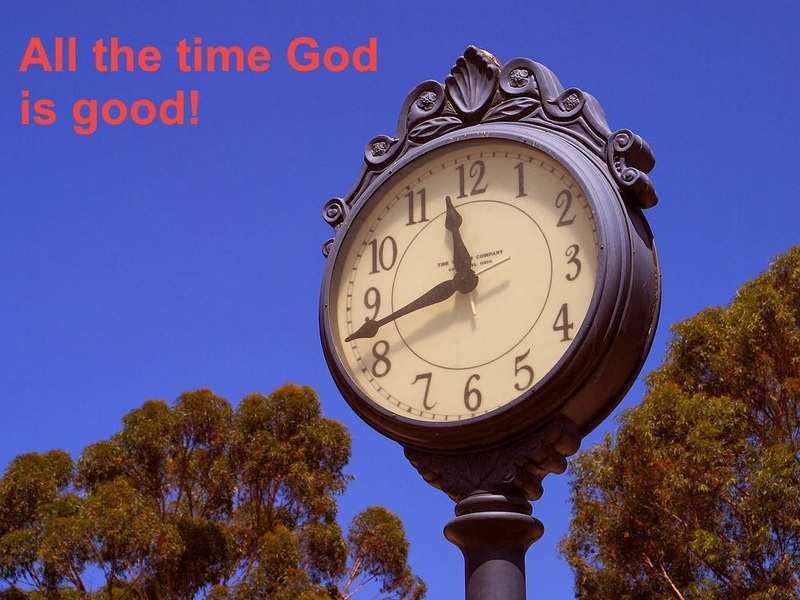 ALL THE TIME GOD IS GOOD! : God is always good. All the time! God is always good. All the time! The Lord is good. He is always good. Welcome to All The Time God is good blog post. I trust these post will bring spiritual enrichment to your soul and refreshing to your spirit. My desire and leading of the Spirit is to proclaim His mercy, His grace, His finished work and His all the time goodness in every facet of human existence! I pray as you read any future post they bring blessing and encouragement to you. If any post is of particular blessing I pray you pass it on. Feel free to quote freely from any post. Blessings to you. God is always good. I wish to proclaim this to the ends of the Earth. For too long the idea man has had of God is not that of a good Father but rather an angry taskmaster. He has employees not sons. He sees these employees as always failing and unfaithful. He can't trust them so He must place burdensome rules and performance requirements in order to achieve any type of blessing. If you aren't experiencing any blessings in your life it could only mean the "Boss" is dissatisfied with your performance! Does this mentality make you want to draw close to God or to remove yourself from His presence? Does this view of God make you want to flee in terror from Him? I submit that this philosophy is one major reason churches and ministries aren't flourishing today. Many an unbeliever was beaten down and pushed down by circumstances and environments for majority of their lives. They don't need to trade one system of oppressive, performance based approval and defeat for another. Thank the Lord the truth is Jesus offers much more for us. He doesn't bring a yoke of tyranny or oppression. Jesus brings love! Jesus and His great love for us is what brings about real change and produces a deeper relationship with Him. We need to heal our image of our Father God and His Son the Lord Jesus Christ. Jesus on Earth was the will of God in action. He demonstrated who God really is. Jesus drew men unto Him with His great love. Jesus never brought disease or bankruptcy to people. My heart's desire is that you study the Word for yourself. See how God's Word reveals Jesus to you. How He is full of compassion and slow to anger. You can come to God and find His love for you will never change no matter what! Be confident in this and watch your walk with Him become more and more fruitful! He is good that is why He blesses you! For the first 46 years of my life I felt like I always needed to "perform" perfectly in order to be loved and accepted by my parents, family, friends and even God! The truth is-He accepts me just as I am, because of Jesus. The interesting thing, once I received the revelation of His love and who HE really is and His goodness, I realized I still wanted to DO everything right but could rest in the knowledge that even when I mess up, He still loves, accepts and blesses me. Not because of my goodness but because of His, HE is GOOD! Grace has never said its cool to sin! Celebrate! It's the glad news! Quick pick up for you! The precious blood of Jesus Christ!